ZELTIQ® Aesthetics, Inc. recently received FDA approval for their new Coolsculpting Mini applicator to treat small pockets of fat. Rhett Women’s Center will be among the first to offer it to our patients. Call or request your free consultation now and receive 25% patient discount. The new CoolMini™ applicator is is designed to treat smaller pockets of fat, including the submental, or chin fat area, more commonly referred to as the double chin. The FDA approval allows patients to successfully address additional problem areas without surgery. 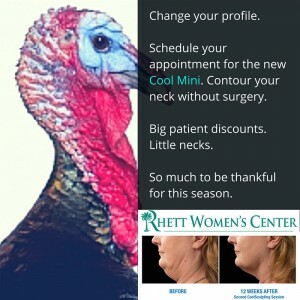 The CoolMini applicator enables Rhett Women’s Center to treat small volume areas of unwanted fat with little, to no downtime. Similar to the other applicators addressing flank, thigh, abdominal and a myriad of other body parts typically harboring stubborn fat, the Cool Mini is a truly compelling alternative to more invasive options like face lifts and liposuction. “Since the CoolSculpting procedure is entirely non-invasive, my patients can typically resume normal activities immediately after treatment. Treatment or an areas takes as little time as one hour,” says Dr. Edmund Rhett. The accumulation of fat under the chin can be a result of lifestyle, age or genetic factors and — unlike other common problem areas of the body — it cannot be hidden or disguised with clothing. Data from a 2014 study conducted by The American Society for Dermatologic Surgery (ASDS) showed that approximately 68 percent of people were concerned with chin and neck fat; this number increased eight percent from the previous year. Additionally, a recent study conducted in the United States revealed that 22.4 million people are interested in seeking non-invasive fat reduction solutions. The CoolSculpting® procedure has demonstrated in over 50 published clinical articles and 4,000 clinical trial patients to non-invasively and consistently reduce unwanted fat and the procedure has been successfully used in over two million treatments to date. The CoolSculpting procedure’s predictable results, non-invasive technology, comfort, lack of downtime and affordable pricing make it a very attractive treatment option for patients looking to eliminate unwanted fat.